C-Frame Workstations offer increased versatility and save space by eliminating the frames needed for front legs. The frame is cantilevered for placing over any work bench, table or wet process work station without taking up valuable floor space and obstructing adjacent work areas. A SAM Fan Filter Unit provides HEPA filtered air over the workspace. Standard voltage is 115 volts with other voltage options shown on a following page. An On/Off switch is installed in a 2”x 4” junction box mounted on the SAM unit. All 115 volt models are equipped with a 8 foot power cord and 3 – prong plug. Other voltages require electrical connection to the power source by a qualified electrician. C-Frame Workstations with lights have an acrylic grille inserted in an anodized aluminum frame which is hinged to open. This permits access to the fluorescent light tubes and removal of the HEPA filter without removing the SAM unit from the frame. 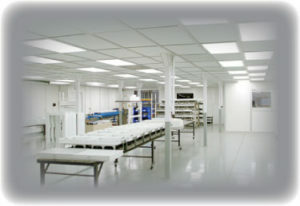 Workstations without lights have a painted white epoxy diamond pattern grille. C-Frame Workstation frames are white painted steel tubing with clear acrylic side and back panels and adjustable leg levelers. C-Frame Workstations with lights are equipped with a 4-lamp light fixture, 120 volt, 60 hz with T8, 32W electronic ballast. Fluorescent light tubes are not furnished with the units because of potential breakage during shipment. 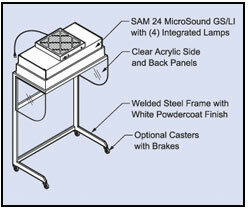 C-Frame Workstations are fully assembled with the SAM unit packaged separately for safe shipping. The self contained SAM unit is easily installed in the frame on site with no special tools required. 805083 Casters, 3” w Brakes, (4) req’d. 905234 Side Panels, 1/4” Clear Acrylic, 24” H x 26.5” D, (2) req’d. 905235 Back Panels, 1/4” Clear Acrylic, 24” H, (1) req’d. 13400 4 Ft. 50.5”L x 26.5”D x 73”H 165 lbs. 13401 4 Ft. 50.5”L x 26.5”D x 78”H 190 lbs.